미네르바 대학 학생들과 함께 하는 10월의 아트업 데이! 이번 아트업 데이에는 미네르바 대학 학생들이 초대되어, '각국의 아트 씬'을 주제로 얘기나누는 시간이 마련되었습니다. 미네르바 스쿨은, 전 세계가 주목하고 있는 혁신 대학으로, 학생들이 4년간 전 세계 7개 도시를 돌며 거주하는 거리의 대학입니다. 요즘 하버드보다 잘 나가는 대학으로 유명하죠. 미네르바 스쿨과 위누가 협력하여, 현재 서울에 거주 중인 미네르바 스쿨 학생들이 아트업서울에 방문해 입주 작가님들 및 한국의 아티스트들과 만남을 가지게 되었습니다. 그래서 이번 아트업 데이에는 특별히 외부 작가님들 또한 초대합니다. 아트업 데이는 아트업서울 입주 작가들이 매달 한 자리에 모이는 네트워킹 파티로, 이번에 아홉 번째 아트업 데이를 맞이하고 있습니다. 이날 맛있는 저녁 식사가 준비되어 있을 예정이니, 미네르바 대학 학생들 및 아트업서울 입주 작가들과의 뜻깊은 저녁 시간을 원하시는 분들께서는 주저없이 신청해주시면 감사하겠습니다. October ARTUP DAY with Minerva School Students! On the ARTUP DAY, students from Minerva School were invited to talk about the art scenes of each country. Minerva School, an innovative university that the world is paying attention to, is a street college where students spend four years traveling around seven cities around the world. These days, it is famous for being a better university than Harvard. 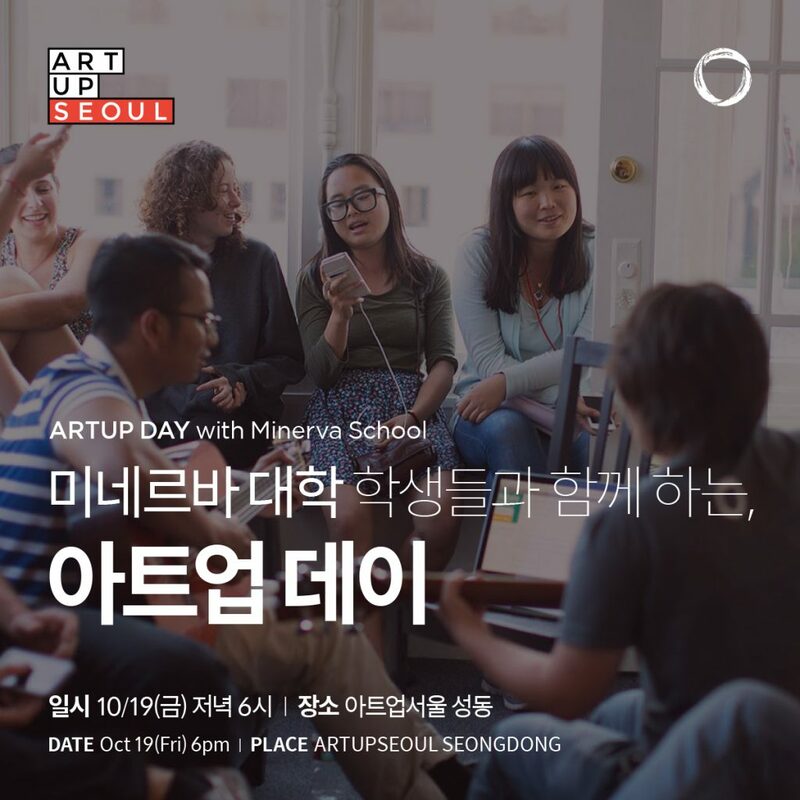 In cooperation with Minerva School and Weenu, students of Minerva School, currently residing in Seoul, visited ARTUP SEOUL to meet with the residents and Korean artists. That's why we're inviting especially outside artists to participate in this ARTUP DAY. ARTUP DAY is a networking party where ARTUP SEOUL artists gather for one place every month. Next is ninth ARTUP DAY. As a delicious dinner will be served on this day, I would appreciate it if you could apply for a meaningful evening with students from the University of Minerva and artists working in Seoul.